At Metal Works 360 Inc. we offer a wide range of frame machine sizes and options. In our deluxe line we offer machines 7' 10" wide and up to 22' 6" long. In our economy line we offer machines 7' wide and up to 18' long. Shown above is our 20' long 2 tower rack from our deluxe line. Our machines come standard with 2 pull towers, and you have the option of pulling configuration. We have both a push up (round) tower and a pull down (square) tower. Both come equiped with 10 tons of pulling power and exclusively at Metal Works 360 Inc. 14" of pulling stroke. All towers come with height adjustable self aglining collars. Metal Works 360 machines are true 360 machines meaning that each tower can rotate all 360 degrees around the machine. They also come standard with 4 adjustable unibody stands and loading ramps. 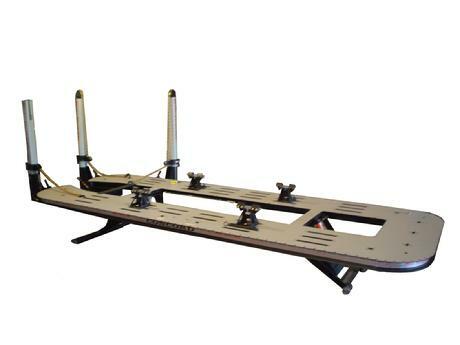 Shown above is a 22' 6" long open front rack from our deluxe line. Roof puller, down pulley, etc. The Easy-Way Workstation is another great product added to the Metal Works 360 line of frame machines and auto body equipment. In this new age of auto body repair the Workstation is in high demand for every work bay in your shop. With its versatility from being a simple lift, to its quick transformation to a full 4 1/2 ton frame rack, there is no machine that can match it on today's market. For more information on this product please select "Workstation" on the navigation tool bar in the upper left hand portion of this page.